Here’s an overview of the main changes LinkedIn is rolling out to groups “in the next couple of weeks,” along with my commentary on how each change impact associations who actively use LinkedIn groups. Standard and Unlisted Groups. All groups will be either Standard (for those that are now Open) or Unlisted (for those that are now Private). Standard Groups will show up in search results (both LinkedIn search and search engines) but the conversations inside the group won’t–only members of the group will be able to see them. Group members will be able to invite any of their 1st degree connections to join. If your group currently has public conversations or is free to join, it’ll become a Standard Group. Unlisted Groups won’t show up in search results and only the group’s owner and manager will be able to invite members to the group. Takeaway for associations: If your group is currently public, any member will be able to invite others to join and people will be able to see the group name listed in search results request to join. If your group is currently private, it will be Unlisted and will no longer appear in search results either on LinkedIn or search engines, and only group owner and/or managers can invite people to join. So if you currently rely on search to attract members to your group you’ll want to make your group public now (assuming you still can change it). LinkedIn says that the group owner has the option to make the group unlisted only when the group is created, so I’m not sure what that means for groups that already exist as private. For Unlisted groups, the group logo will only be visible on members’ profiles to other members of that group and the group will not be findable via any search engine—so if people have been finding your group, then your organization, via LinkedIn groups, that’s about to end if your group is Unlisted. Here’s more information on Standard vs. Unlisted groups. All Groups Are Now Private Groups. LinkedIn’s “research” (that no group moderator was apparently ever involved in, based on LinkedIn’s group moderators group) has “shown that professional conversations are most effective in a private trusted space, so conversations in groups won’t be visible until you’ve joined the group.” Association takeaway: again, visibility of your group will be drastically limited, if not eliminated entirely in the case of Unlisted groups, and you’ll now have to rely on existing members inviting their 1st degree connections. Group owners and moderators will be able to invite people to join Unlisted groups, but that will involve researching potential new members and reaching out to them rather than vice versa as LinkedIn groups have worked up until now. All Groups Are Now Members-Only Groups. Bye open groups–joining a LinkedIn group will now require either an invitation from an existing member or the group owner/moderator, or approval of a users’ request to join a Standard group. 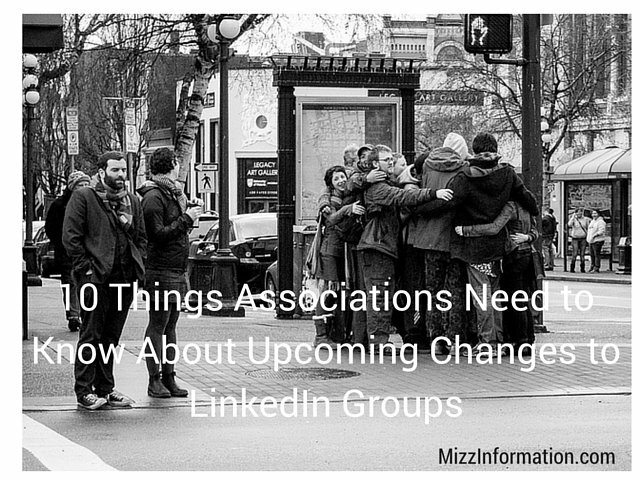 Association takeaway: operating a LinkedIn group just became a lot more labor intensive, as even Standard groups will require approval of new members…as well as additional moderation due to #s 4 and 5 below. Content Moderation. LinkedIn has decided that moderation is bad, so they have disabled the ability to have posts be moderated prior to being posted. All posts (except for those that LinkedIn’s mysterious algorithm deems spammy) will be posted instantly to a group without the need for manager approval. Group owners, managers, and moderators can still remove off-topic conversations and place members in moderation, and other group members can also flag inappropriate comments and conversations after they’ve been posted. Association takeaway: if you currently require posts to go through moderation before they are posted to discussions, that functionality will now disappear and you’ll have to be a lot more vigilant about moderating the discussions tab. Weirdly, though, while LinkedIn has taken away the ability for group owners and moderators to moderate the content in their own communities, they’ve at the same time decided that they are better judges of what’s appropriate for your group…see #5. Better Content Filtering. Because no control over what’s posted in your own group is “better,” LinkedIn “has improved the filtering of spammy and low-quality content so that promotional conversations stay out of the conversation feed and conversations can happen around more relevant topics.” Also, Job listings and job conversations posted to the main conversation feed are automatically moved to the Jobs tab—that will presumably not be optional anymore, as LinkedIn says “Every group will have a Jobs tab.” Association takeaway: that group you thought you “owned”? LinkedIn will be deciding what content belongs and doesn’t. They’ve already been doing it for a while now, moving valid posts to the Promotions tab…but oh, wait, see #6 for more on that. 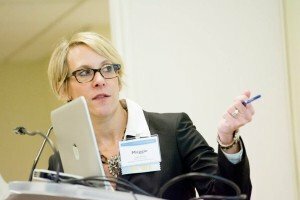 Also, if your association has its own career board and doesn’t permit job postings in its LinkedIn group, you used to be able to disable the Jobs tab; apparently, that ability will be disappearing and that will be another area you’ll have to spend time moderating–and based on my current and past experiences moderating job postings, it can be a considerable amount of time. You also aren’t able to post your OWN jobs for free in your own group; LinkedIn took that ability away a while ago. Removal of Promotions Tab. LinkedIn says “General member feedback indicates that promotional content in LinkedIn Groups isn’t a valuable experience, as it can quickly lead to spam”…so they’ve decided to remove the Promotions tab. To which they have been moving posts for a while now. Now, instead of the Promotions tab, any posts their algorithm decides are promotional will go to the moderation queue for the owners, managers, and moderators to approve, and job posts will be automatically moved to the no-longer-optional jobs tab. Association takeaway: more work for moderators but, in theory, less spam. Removal of Subgroups. Per LinkedIn, “We recognize that subgroups were important to the organization of some of our larger groups. However, for the majority of our members, the experience was confusing. In order to surface these subgroups to members and to help these subgroups grow, they will now be treated as their own independent groups. As a result, group owners will no longer be able to create subgroups. If you’re the owner of a parent group with subgroups, you may wish to rename your subgroups.” Not sure what this means for subgroups of closed groups—I assume this means they’ll also default to being Unlisted groups, which means they’ll be virtually invisible. Association takeaway: if you have active subgroups, you’ll want to list them in the About page of your group, and/or figure out some other strategy of marketing them, and the only way people will be able to join is if the owner or manager of the group invites them. Member Approval in Standard Groups. When a member requests to join a Standard Group, their connections in the group can approve the request. Group owners and managers can also approve any request to join. Association takeaway: you no longer will be able to control who joins your Standard groups, as any member connected with the new member will be able to approve their request to join. Not the biggest deal in the world, but yet another reminder that LinkedIn owns Groups and makes the rules. LinkedIn Groups iOS Mobile App. LinkedIn has released an iOs app for Groups (Android version “available soon.”) Association takeaway: While presumably members will no longer be able to opt to receive daily email updates from groups (see #9), they will be able to receive push notifications for group conversations. This could either be cool, for those members who want real-time updates, or could result in members complaining about the notifications, which I’m sure will be enabled by default, so you should probably be ready to start explaining how to disable notifications just in case. There are a few other minor changes coming—the ability to post images with posts (although not in comments) and the ability to use @ mentions in conversations, which seems like a recipe for spammy-ness to me. And there you have it–your association’s “own” group, totally remixed for you, with a “couple weeks” notice to get ready to deal with changes that will likely entail a lot more moderation and staff action than previously required, and will dramatically decrease the visibility of your group to potential new members or prospects. But I guess that’s the eternal rub of free platforms; you get what you pay for, so when you’re paying nothing, I guess you forfeit the right to be mad when things change on a dime. Good overview, Maggie. This is a big deal for many associations. What a great overview, Maggie. Thanks for hitting all the major bullets. Awesome job Maggie! Very insightful. Maggie – you always save the day when it comes to understanding what LinkedIn might be, and then is, up to. I’m still not exactly sure what actions to take with my 19 chapter subgroups, but I’m about to do some research. Thanks for the heads up!